Cooking Meat - stuff you should know. One of the hardest things about cooking meat is knowing when it's done -- according to your liking, as well as what's safe. Wonder no more. 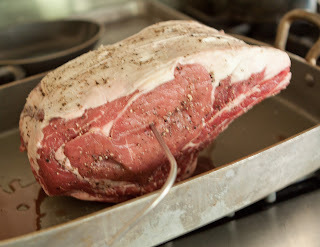 Here are a few tips if you want to learn how to cook great meat . . . .
1. Buy a good quality cut of meat -- there really is a difference. That picture at the top of this post . . . horrible cut of meat. I bought it on sale during the holidays. Sale does not always equal good, just so you know. 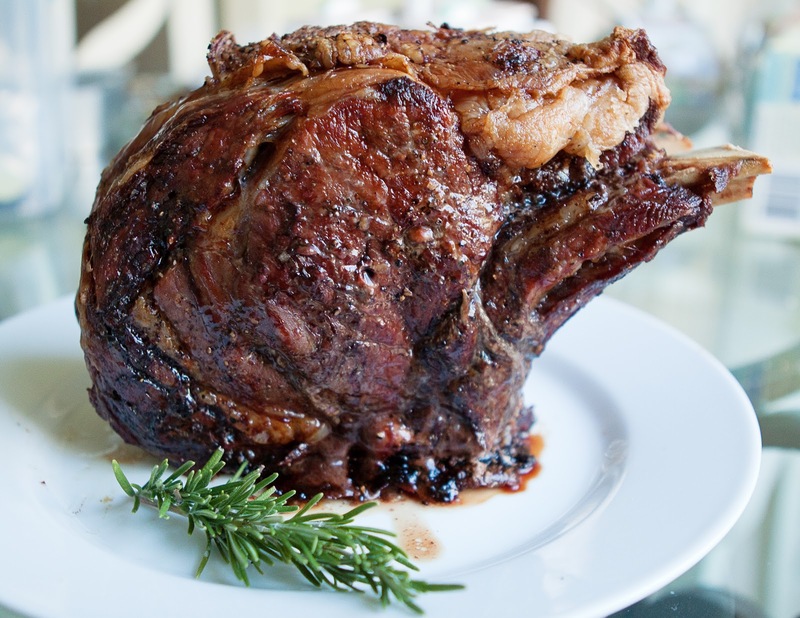 My entire family refused to eat this prime rib roast, it was that bad. Big waste of money in the end. Find a grocery store with a knowledgable butcher and ask when in doubt. Don't rely on everyone behind the counter -- some of those worker bees really don't know what they are talking about, and you can tell if you ask them a question that you know the answer to, like "What's a great cut of meat to roast in the oven?" If they suggest a chuck roast, don't listen to a word that person says -- a chuck roast is a pretty tough cut of meat and needs to be braised in order to break down the fat molecules. 2. Use a digital meat thermometer with an internal probe. It ensures perfect doneness if you know the exact temperature you are trying to achieve. 3. 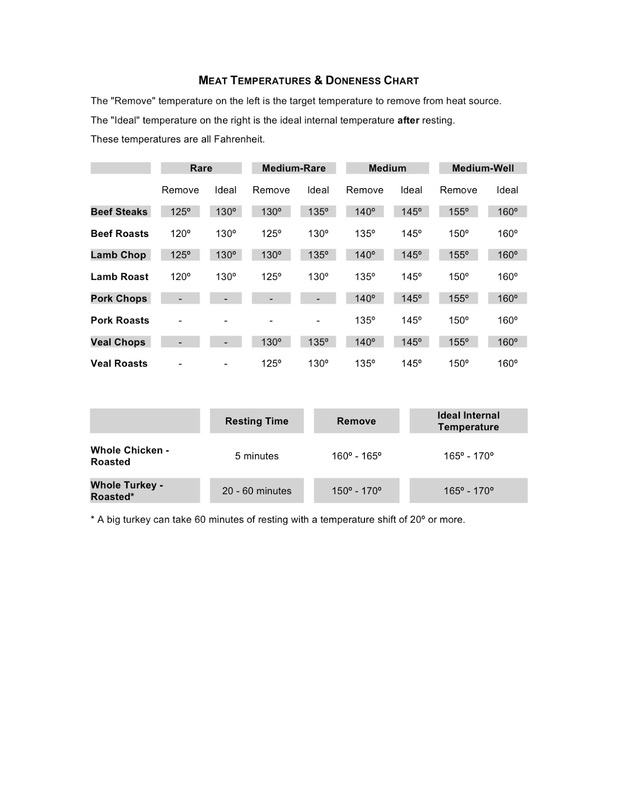 Follow a meat doneness chart, and once you've cooked a particular type of meat to your liking, write down the temperature you programed on your digital thermometer. I ALWAYS forget. 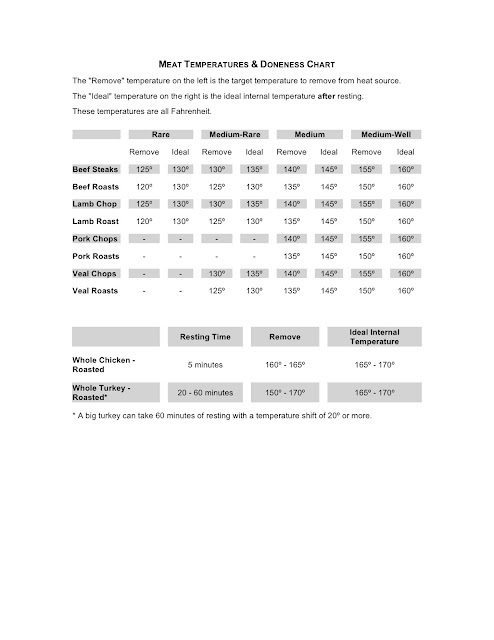 Here's a great chart that allows for resting time (the time you let meat sit once you have removed it from the oven. That's an important step because you want to allow the meat juices to settle before you start cutting. If you've ever seen a massive pool of red liquid sitting on your plate, chances are the meat wasn't allowed to sit for a few minutes. If you want a recipe on how to make a perfect roast -- it's here. So yummy with mashed potatoes and gravy. It reminds me of Sunday dinners at my grandma's house.